Apps have two different types of version numbers plus there are differences between versioning for different platforms. 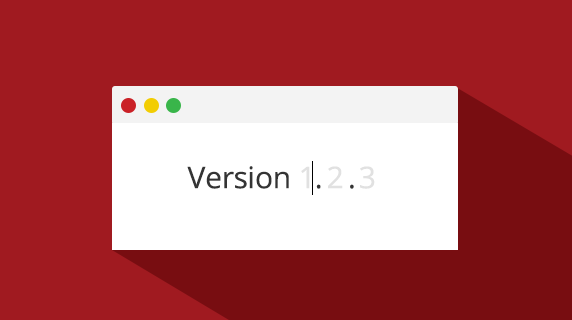 Titanium 4.1.0 comes with better support for versioning iOS apps. Let’s explore how you would use this in an app for iOS and Android. First of all there’s the release version number. This is the version your users see. Each public release must have a unique version. Apple calls this the CFBundleShortVersionString and for Android this is android:versionName. Both suggest (and to different lengths require) you to follow a subset of Semantic Versioning. The other type of version number is the build version. Before every public release, you probably go through several iterations of development and test builds that you distribute via alpha/beta testing on Google Play, TestFlight Beta Testing with Apple or another service like Installr. This is where both Android and iOS (and others) do not follow semantic versioning anymore. If they did, the test builds for 1.1.0 would be versioned as 1.1.0-X where X can be many sorts of pre-release identifiers. Instead, a separate build version is used. This version is normally not visible to the user and should be unique for each test build. Apple says you should follow the same simplified semantic versioning format for this CFBundleVersion as well, but the default for a new XCode project is 1. On Android android:versionCode must be an integer. This makes more sense, since if you would follow Apple’s guidelines then how would you version test builds for an upcoming 1.1.0 release? If you would use 1.1.1, 1.1.2 etc then what would the release after 1.1.0 be and the build versions for that? We’ll come back to that. 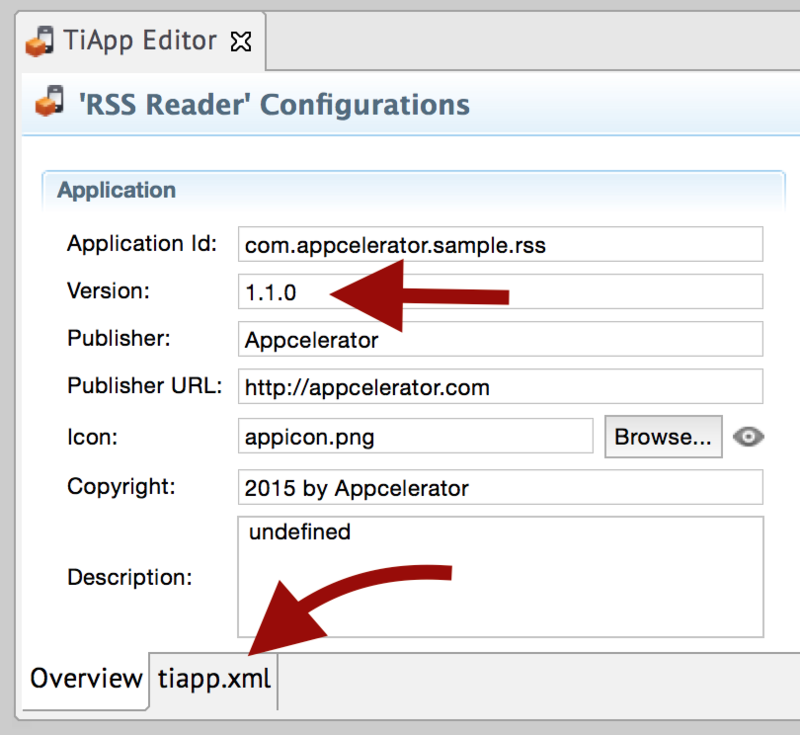 The tiapp.xml has a tag that can be edited via Studio’s TiApp Editor. Titanium will use version as-is for CFBundleVersion (build) and will try to format it as a three period-separated semantic version for CFBundleShortVersionString (release). Until 4.1.0 you could not manually override this. The only way to set a different build version was to set version to something like 1.1.0.123 since Titanium would then normalize it to 1.1.0 for the release and leave it as-is for the build version number. This of course is not a proper semantic version, but Apple did accept it – allowing you to distribute multiple test versions via TestFlight leading up to a single release. For Android, Titanium will use version as-is for android:versionName (release) but unlike iOS the build version (android:versionCode) is not based on version. You will have to set it manually via the android section in tiapp.xml or it will always default to 1, which is… well, not unique. All good developers are lazy, so lets automate this using a Grunt task. If you are not familiar with Grunt, read their Getting Started. We will be discussing Grunt and other task runners and how to use them for Appcelerator development in a later post. The Grunt task here allows you to bump the major, minor, patch or just the build version – which will always be incremented. It assumes version to be major.minor.patch and to find only android:versionCode and CFBundleVersion in the android and ios sections so that Titanium will set release version numbers. @Italo, what exactly is that fixing? Warning: Task “version:minor” not found. Use –force to continue. @Douglas are you sure you have both global grunt-cli and local grunt installed? @Michael did you test if that alloy.jmk results in the bumped version used in the Titanium compile following the Alloy compile? I’m asking because when Alloy runs as part of the Titanium compile the Titanium CLI will already have read the tiapp.xml file (with the old/existing version). قال:i have a question , i use Google Play on my gaxaly s ii and i open it via wi-fi , the internet connection is very speed , however the market loading very slowly , the market only but browsing is very good , anybody know why ? I guess Google Play has some problems then?